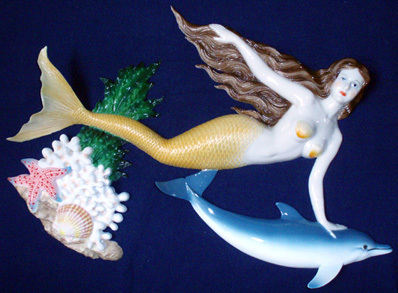 This stunning Mermaid & Dolphin Wall Sculpture is crafted and hand painted with a stunning detail finish. With the world's love of ocean creatures, this magnificent piece of artwork is sure to be an admired accent in your home or office. Fiber glass, 18.75 inches W. x 12 inches H.
Note: Each of these pieces is hand painted and unique. There may be variations in color from those in the image.